Lonely Planet’s legal team are a fascinating example of the innovation of long-standing work practices that has infected Lonely Planet’s Melbourne head office since 2008, where the techniques of agile have gone far beyond IT, and have been taken up by other knowledge workers in the 300 strong organisation, becoming inevitably lean along the way. The Legal Affairs group has a highly strategic role at Lonely Planet – on top of getting the run of the mill ‘business as usual’ (BAU) stuff done like contracts for suppliers and distributors, they assist with commercial negotiations, advising on business strategy for the various legal entities within the group, and managing risk. 1. The legal team was commonly working late, sometimes until midnight. This was beginning to cause burnout and frustration. Working across multiple time zones supporting London and San Francisco offices did not help this! 2. Job satisfaction was waning, with few of the improvement ‘project’ ambitions identified in the annual off-site planning session ever achieved in the face of day-to-day demands. The backlog of work to be done was substantial, and a weight on their shoulders. 3. Some of that work backlog involved significant changes to document structures (eg contracts and work orders) to cope with an increasing adoption of agile methods of working across the whole Lonely Planet enterprise, with many old contracts obsolete in a ‘trust, time and materials’ world. 4. A good deal of the legal team’s work was found to be generated by ‘failure demand’ (as John Seddon terms it) where rework on a detailed contract written without all the parameters of the deal known (eg too early) meant abandonment of much of the work produced, for another document structure entirely. For example, it is fruitless to iterate a profit-share based partnership agreement into an outsource agreement. 5. The ‘drop-in’ nature of demand from internal clients, and the general assumption that lawyers sitting quietly at their computer screens were not really doing anything productive, so could apparently be interrupted, was highly frustrating. 6. Frequent task swapping was the stock in trade of the team’s approach to managing multiple priorities. 7. The lack of transparency of priorities of work being done by the team led their clients to generally assume they were not working on anything as important as their need for a non-disclosure agreement or contract review. An internal survey suggested they were sometimes perceived as a blocker, rather than a partner or valued advisor for the business people needing legal support. 8. The productivity of two retained external legal services suppliers (a small generalist firm, and a large specialist group) was low, with little work actually farmed out – it was easier to just ‘get on with it’ and have the internal team members do it themselves by working late, rather than briefing and supervising a partner’s work. 9. The costs were not managed holistically – internal staff resistance to engaging the external partners was based on the false perception that the internal lawyers were free of charge, whilst the external lawyers cost cash. 10. Internal clients would commonly provide deadlines for work that were ahead of the real deadlines, in order to force prioritization of their contract over other people’s work. Similar exaggeration of deal value was also evident, to get work prioritised. 11. The professional ethics and standards of lawyers is a natural source of perfectionism, which is not well suited to fast-moving environments where an internal client may come to them for advice and service at an early stage in their process (ie not knowing all the facts). This also leads to rework. 12. There was not universal support for the work priorities of the team being advertised on a board like an agile board in a public place – there was a perception that would compromise their position as advisors to the multiple internal clients. This provided an interesting cultural constraint to the adoption of agile. 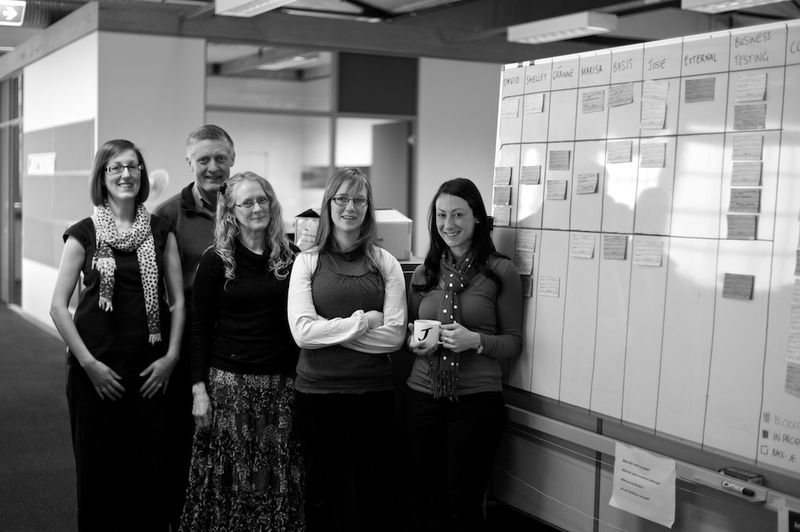 The Legal Affairs team quickly became Lonely Planet’s most ‘lean’ operational group in the traditional sense of the term – where the principles of delivering value, reducing waste and continually improving the flow of work through the system are the highest priorities, and the system is viewed (and reviewed) continuously from end to end. 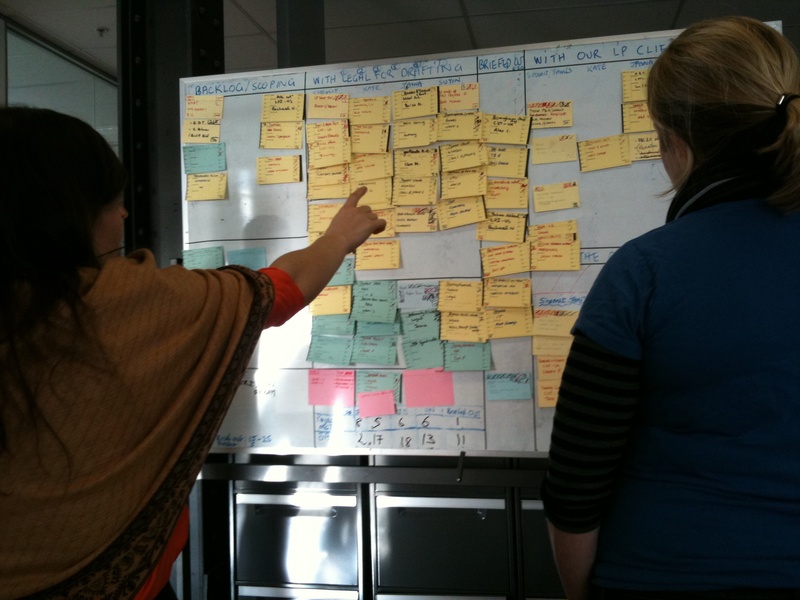 The team adopted an agile board having seen how they could get their own requirements prioritized with IT-focused project teams around the organisation, when attending planning or standups with a legal card or story in hand in 2008. They had a strong sense that their old way of working until the job was done was not sustainable – the end result is a fascinating hybrid of agile, kanban, scrum and lean practices. An early iteration of the Legal team's board already shows the'with client' columns as a stage before 'done''. 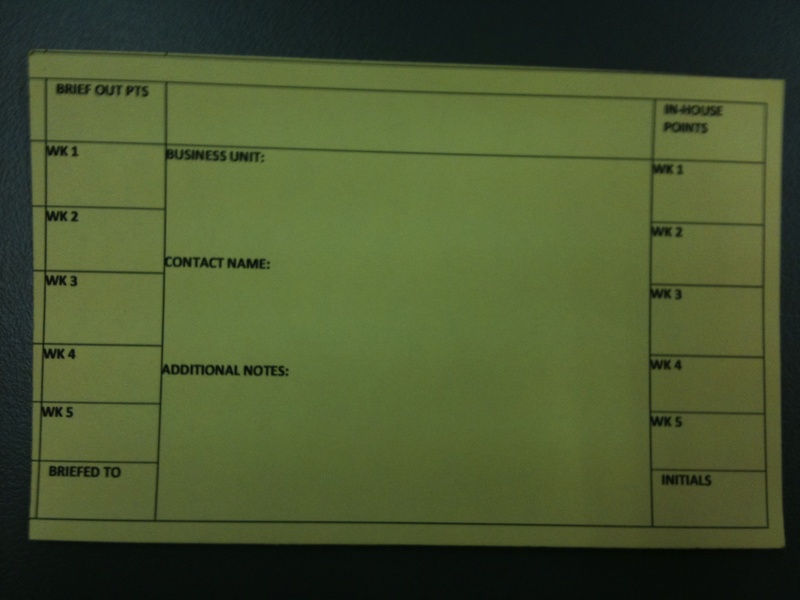 Blue cards were for improvement projects, yellow for BAU. An estimation model has been tried in bottom left to plan the workload for each person during the week, and data has begun to be collected. 1. The team’s entire workload is represented on a single whiteboard. This has resulted in greater respect for the team’s ability to carry a diverse and heavy load, keep it prioritized and deliver value in a weekly iteration with an element of continuous delivery of value – there is no ‘release’ as such. 2. The initial exercise to ‘out’ all the hidden demand resulted in 2 whiteboards completely wallpapered in backlogged projects and tasks of a myriad of types. 3. 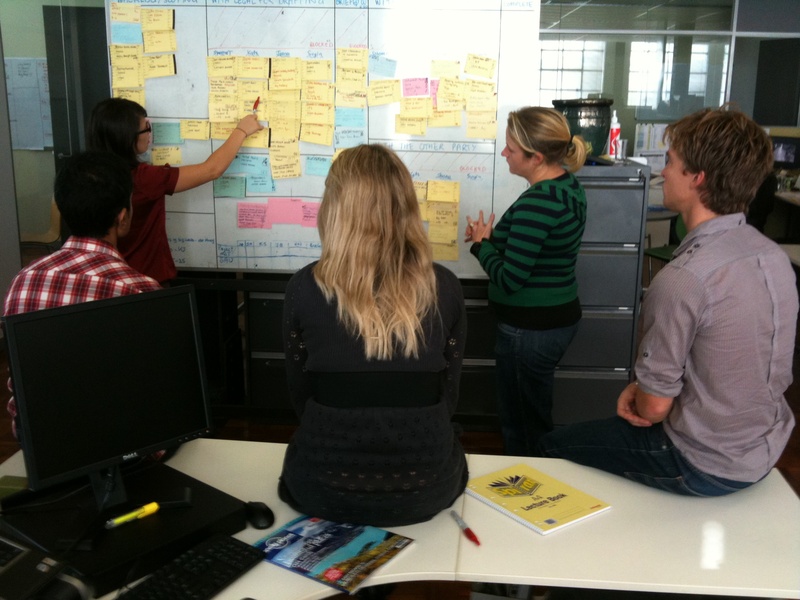 A new style of agile board had to be invented – recognisable to IT practitioners as having a backlog; a ‘blocked’ section; an ‘in progress’ section; testing (document with client); and ‘done’ columns; while allowing for individual lawyers having specialised skills (eg international law, digital contracts), each team member owning their prioritized backlog and daily work list. Customised card designed by the team. It tracks time spent by both internal and external team members. internal and external team members. These are referred to as stories, and the time the card spends on the legal board is logged (on the card) and monitored closely. 5. The team analyses productivity through a shared system of sizing work – an agile tool based on ‘points’ of effort per a card. The team use a Fibonacci sequence for sizing work, and calibrate against known pieces of work, allowing for variance around the difference in time taken that will occur if an expert lawyer picks up that card, versus say the Paralegal. 6. Work is tracked all the way to it turning to cash. Cards stay on the board while they are back in the hands of the LP party who requested it, as well as the third party. Blockers to executing the contracts or agreements are monitored by whoever worked on that card. The team uses a questioning approach akin to the ‘5 whys’ of Systems Thinking to understand the root cause of any delayed work. 7. The team has a daily standup at 9:30 to discuss the day’s work and evaluate any new priorities. This takes around 15 minutes. The standup thoroughly reviews the do-ability of the remaining days of work given the output to date that week. 8. Other teams requiring legal work now bring their cards/stories to the Legal Affairs board – leaving a placeholder card back on their originating agile board. These are fed into the board by the team from a ‘daily news’ section at the left side – mostly weekly (but sometimes daily) by re-prioritising other tasks. 9. Prioritisation by business value is largely delegated to the Legal Affairs team, who act as the trusted broker for the many business stakeholders. The transparency of their priorities on the board helps this considerably. 10. The board has an element of Kanban in that work in progress (WIP) is limited by the size of the column for each team member (after running for a year, cards now conform to a more regular size in points), and the 1-week backlog ‘box’ as well. Stories have evolved to being of similar size, but there is still variation. 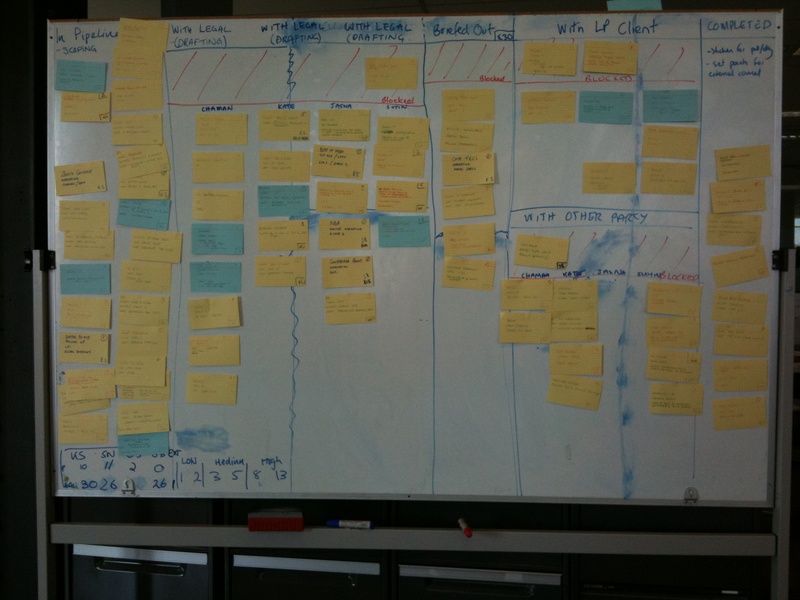 This board (second generation) clearly shows the kanban-like Work in Progress (WIP) limits demarcated by tape. Ultimately, the separation of system improvement stories (green, in their own box) from BAU (yellow) stories proved ineffective. Sharp eyes will notice the 'blocked' section has been removed - this was judged not necessary as blockages were the key discussion at standup. 11. The working rhythm is a week, starting on Tuesday to allow for international work to be completed on Monday for the USA and UK offices. 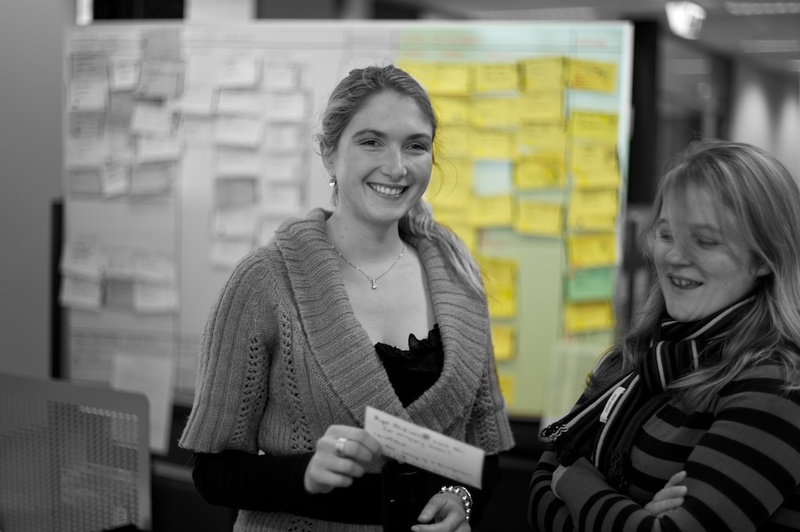 Retrospectives are held two-weekly. 12. Work is tagged on the cards (using sticky coloured dots) as being revenue focused, corporate support or otherwise – this enables prioritization and communicates to other clients why a particular card (especially revenue stories) has priority. 13. The Manager’s role is the maintenance and improvement of the overall system – represented by the board from end to end. The whole team engages in the maintenance and continual innovation of the system of working, reviewing it through retrospectives and client surveys. Thus the board has changed substantively in the two years the team has worked this way. 14. The team uses the Net Promoter Score toolkit to measure internal customer satisfaction. Staying in touch with their internal clients is vital to them, but the main focus is the external customer or end customer for the work. The job is done when cash flows from the contract. 15. There is an allowance that cards/stories grow in size during the week because of complexity of the work – it is accepted that legal complexity (especially in foreign jurisdictions) will be uncovered along the way, and that complete definition of the issue up-front rarely happens. 16. The team has developed a strong grasp of the ‘minimal marketable feature set’ in the way they draft contracts – putting an early copy in front of the internal client as quickly as possible for discussion. They encourage people to consult early on their business challenge. 17. Cards for system improvement (including project work to build smarter ways of enabling clients to self-serve with template solutions and advice) are a different colour (green) and are fed into the overall weekly program. There is less of this ‘templating’ work done than was originally envisaged, as the team now focuses on coping with inevitable variation in work. 18. Unrealistic planning of long-term goals has been abandoned in favour of putting the team’s energy into regular innovation of their processes and the system by which they get work done. 19. The outside legal partners worked within the team for several weeks to understand the new process, and are now utilized fully in that process. Lonely Planet's external partner firms came to the LP Office to work inside the team for a period to understand the new way of working. One of the goals was to increase the utilisation of these partners, without losing valuable team explaining the brief to the point of doing 80% of the work required. 20. Reporting to internal stakeholders is now reduced as they can drop by the team and see exactly where their work is prioritized on the board. Lonely Planet's SAP team, with clearly identified individual backlogs and WIP limits, and sophisticated card design for tracking work, have adopted many of the Legal Affairs team's practices and innovations. Other Lonely Planet teams who have the same operational parameters – individual specialists in a team situation, have picked up many of the innovations developed by the Legal Affairs team. The team adopted these new work techniques with great enthusiasm and enjoyed mastering their own destiny. With coaching and support, the fundamental change to a lean way of working took less than 100 days, and their commitment to continuous improvement will likely return even greater results for customers going forward. The team have grown their internal Net Promoter Score consistently, and most importantly of all, regularly head home early in the evening after highly productive working days. The focus on end-to-end process and the adoption of the final customer as their own customer (rather than a traditional shared service mentality with internal customer focus) resulted in about a 25% improvement in productivity overall for the team. This was reflected in the ability to absorb a reduced headcount in 2011, in a period where demand for the team’s services was continuing to grow. Our special thanks go to the Legal Affairs team and all the people who have worked on making this amazingly innovative work environment at Lonely Planet – Suyin, Chaman, Kate, Jasna, Naomi. We hold you in awe.